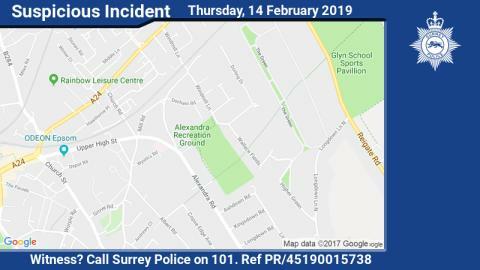 Enquiries remain ongoing after a 12-year-old boy was approached by a man on his way to school in Epsom on Tuesday morning (12 February). The boy was walking through Alexandra Park on his way to Glyn School around 8.10am when the man approached him and asked to walk with him. The man accompanied the boy to Church Road where the boy was able to run away. The man is also reported to have approached the same boy the previous day (11 February). The man is described as black, in his 30s, around 6ft tall, with very short black hair and stubble on his lip and chin. He spoke with a deep voice. He was wearing a black Nike puffed jacket, black gloves, blue jeans and black trainers. Epsom and Ewell Neighbourhood Sergeant Jim Dawborn said: “We are carrying out a number of enquiries to establish the circumstances of this incident and to identify this man and what his intention was. Extra officers will be on patrol in the area at school drop-off and pick-up times in the hope that we can locate this man, as well as to offer reassurance to pupils and their parents. If you recognise the man in this description, or you have any other information which might help, please call us on 101 (999 in an emergency) or http://surrey.police.uk/TellUsMore quoting reference PR/45190015738.